Having Insta-ready sun-kissed waves is definitely summer hair #goals. 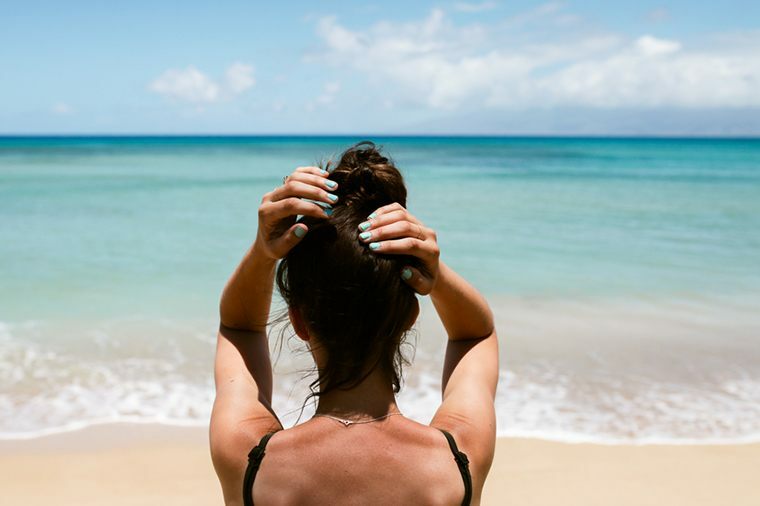 But with sweat, salt air, chlorine, and scorching rays to contend with, chances are the picture-perfect balayage you paid good money for is starting to look pretty worse for the wear. For expert advice on reining in your mane when temps skyrocket, I turned to Will Johnson, owner and master stylist at the cool-girl salon Whistle in New York City. When it comes to warm-weather tress trouble, he’s seen it all. “I’ve had people come to the salon with green hair,” Johnson says. Keeping your locks shiny and healthy in the summer is a struggle for everyone, but it’s a particular challenge if you have color-treated hair: Even if you go to a top salon for a great dye job, it can still fade if you don’t show your strands some TLC. “The color molecules will sip out if you don’t protect them,” Johnson says. “When your hair’s dry or brittle, those colors aren’t going to stay in the hair.” This is a fair warning to those of you who have unicorn hair and don’t want to lose that magic before summer ends. So what can you do to keep your locks luscious during your #99daysofsummer? Here are Johnson’s 3 rules to live by. You could also use a leave-in conditioner or coconut oil, he notes—just make sure you dampen your head in some way before diving in. I’m not talking about the supplement or your fave morning face serum—Johnson recommends literally putting the vitamin on your hair. “Vitamin C will remove all of the chlorine and heavy metals from the hair,” he says. The acidic nutrient balances out the more basic pool sterilizer, returning your hair to its natural pH. “This helps refresh [your hair] and keep it balanced,” Johnson explains. You can make a post-swim-meet treatment for yourself at home, Johnson says. Just mix a tablespoon of vitamin C powder with a pint of water, apply it all over your hair, and rinse after one to three minutes. “If the hair’s actually green from chlorine, make the solution stronger with one tablespoon to a half-pint of water and leave on your hair for up to 40 minutes,” advises Johnson. See ya, ‘do-messing metals. And he points out that you should reapply every couple of hours (or more), just like you do with your skin. Scalp sunburns are no fun, after all. To stay totally safe, this is the smart woman’s guide to sun protection. And these are the 9 best moisturizing sunscreens for your face—with no chalky streaks in sight.